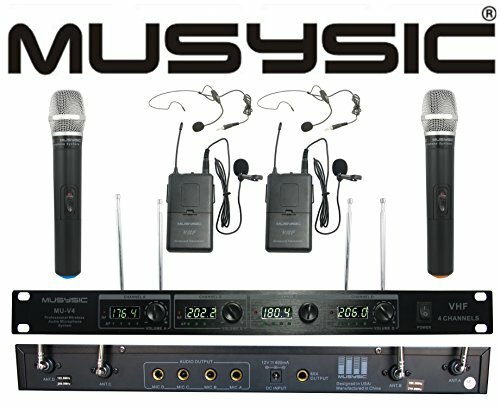 4-Channel Professional VHF Handheld & Lapel / Lavalier Headset Wireless Microphone System by MUSYSIC at IGWT. MPN: MU-V4HL. Hurry! Limited time offer. Offer valid only while supplies last. The MUSYSIC MU-V4HL is for very high quality professional and reliable 4 channel VHF wireless handheld & Lapel / Lavalier headset microphone systems. The MUSYSIC MU-V4HL is for very high quality professional and reliable 4 channel VHF wireless handheld & Lapel / Lavalier headset microphone systems. It uses the most advanced technology called SMT (Surface Mounted Technology) and is made of the highest quality surface mounted components to ensure its quality and reliability. The MUSYSIC MU-V4HL Quad 4-Channel VHF Wireless Microphone System is a cost effective, multi-microphone solution that supports simultaneous operation of up to 4 wireless microphones. The MU-V4HLQuad receiver features 4 discrete audio channels with level control and an 1/4" output per channel. Adjust microphone level separately using the level controls on the front panel. This system includes 4 dynamic handheld & transmitters with on/off/standby switches. The MUSYSIC MU-V4HL Quad is ideal for restaurants, bars, schools, presentations, small performances, houses-of-worship, professional performance, or home karaoke and more.